This year, the theme for the RGD’s (Association of Registered Graphic Designers) DesignThinkers conference is one that resembles how most designers approach their craft: bold and without apology. 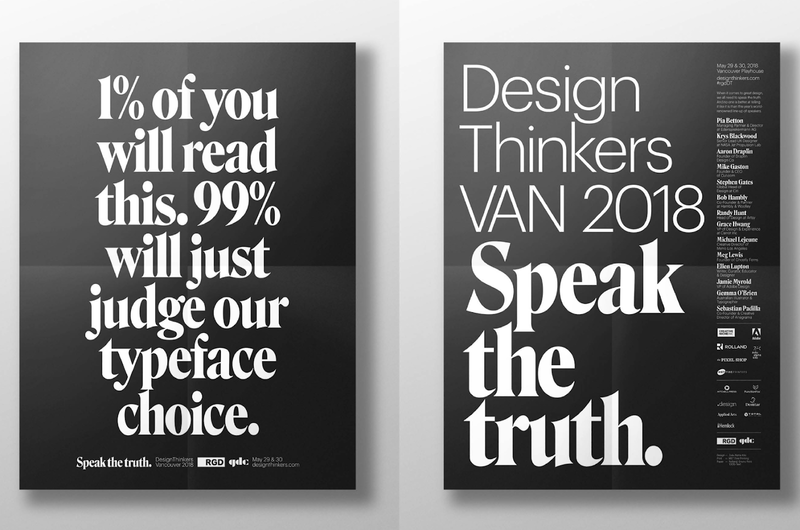 ‘Speak the Truth’ is a concept developed by Toronto’s Zulu Alpha Kilo and focuses on exposing the truths of design around us, in a humorous, relevant, and sometimes provocative manner. The DesignThinkers conference, which takes place in both Vancouver and Toronto, is a two-day event where designers and speakers alike are given a platform to share their unique point of view on branding, trends, communications technologies and design management. The conference takes places on May 29 – 30 at the Vancouver Playhouse, and October 24-25 in Toronto at the Sony Centre and St. Lawrence Centre for the Arts.